N wind 11 to 13 kt. Mostly clear. . Waves around 2 ft.
N wind 9 to 11 kt becoming W in the morning. Sunny. . Waves 1 to 2 ft.
NNE wind around 13 kt. Mostly clear. . Waves around 2 ft.
N wind 9 to 12 kt becoming W in the morning. Sunny. . Waves 1 to 2 ft.
NNE wind 13 to 18 kt increasing to 22 to 27 kt after midnight. 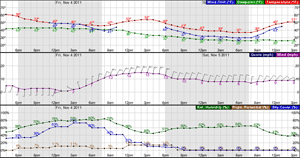 Winds could gust as high as 35 kt. Mostly clear. . Waves around 2 ft.
NNE wind 21 to 27 kt, with gusts as high as 35 kt. Sunny. . Waves around 2 ft.
NE wind around 20 kt, with gusts as high as 26 kt. Mostly clear. . Waves around 2 ft.
N wind around 20 kt, with gusts as high as 26 kt. Sunny. . Waves around 2 ft.
NNE wind around 19 kt. Mostly clear. . Waves around 2 ft.